Long story short, I fell in love with Switzerland and didn’t want to leave. I found it to be a very beautiful, clean, organized, safe-feeling country with friendly people and would highly, highly recommend it if you are looking to take a jaunt across the pond. 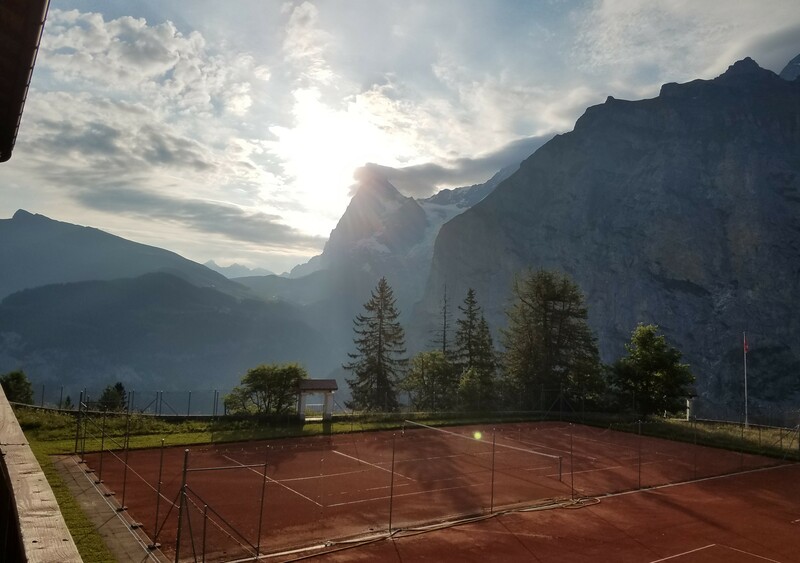 I mean, look at this view from my room where I stayed in Mürren – INSANE, right? This was the first time I returned home from a vacation and felt barely more than a glimmer of that “home-sweet-home!” vibe that I’m usually all aflutter with when my plane touches down in Detroit. My heart was still in the Swiss Alps, and it took two full weeks for it to travel back to me and for me to finally feel content with being home again. Now I’m back in the swing of everyday life again and embracing the D – and my kitchen! While I had a lot of fun on my trip and LOVED not having to do dishes for a while, I’m excited to be engaged in the act of recipe creation once again and find myself bubbling with ideas. Quinoa Garden Pasta Salad seemed like a no-brainer recipe to open with after my hiatus because of us being smack-dab in the middle of barbecue season here in the Northern Hemisphere. And what barbecue is complete without pasta salad? 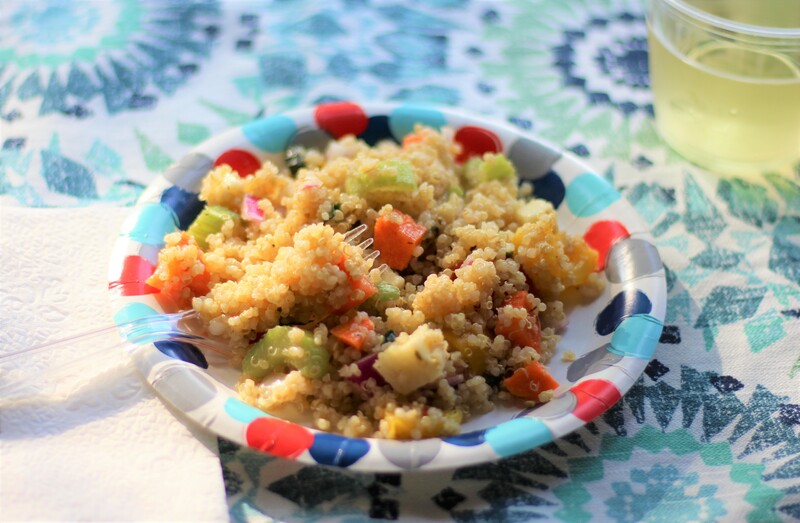 I mentioned in the opening of this blog post that this Quinoa Garden Pasta Salad is a revamped version of a classic favorite. OK, so it’s not so much been revamped as upgraded – the pasta noodles you traditionally see in pasta salad have been traded out for ~drum roll~ QUINOA! Yes, quinoa, that powerhouse ancient grain, takes the starring lead in our recipe today. Protein-and-fiber-packed, loaded with vitamins and minerals like manganese, magnesium, folate, and iron, it’s hands-down a healthier – and gluten-free! – alternative to pasta. Mix it with crunchy veggies, yummy mozzarella cheese, and a zesty homemade Italian dressing, and you’ve got a flavorful side dish that is filling enough to double as an entrée. This Quinoa Garden Pasta Salad is also meatless, making it an excellent vegetarian option at typically meat-centric backyard BBQs. And of course, omitting the cheese easily makes it vegan. Another thing I appreciate about this Quinoa Garden Pasta Salad is that it’s prepared to feed a crowd! This recipe yields a big ol’ bowl of it (approximately 15 one-cup servings). And because it tastes best chilled, you can easily make it the night before your event; it will keep well in the fridge. OK, on to the recipe and fully embracing summer-soiree season! A classic favorite vamped up, with protein-and-fiber-packed quinoa subbed for pasta. So filling, it can easily be a meal in itself! Rinse the quinoa in a fine-mesh strainer. Add with the water or stock to a medium-sized pot. Bring to a boil, then cover and reduce the heat to medium-low and let simmer for 15 minutes, or until all of the water has been absorbed. Add to a large bowl and let cool. 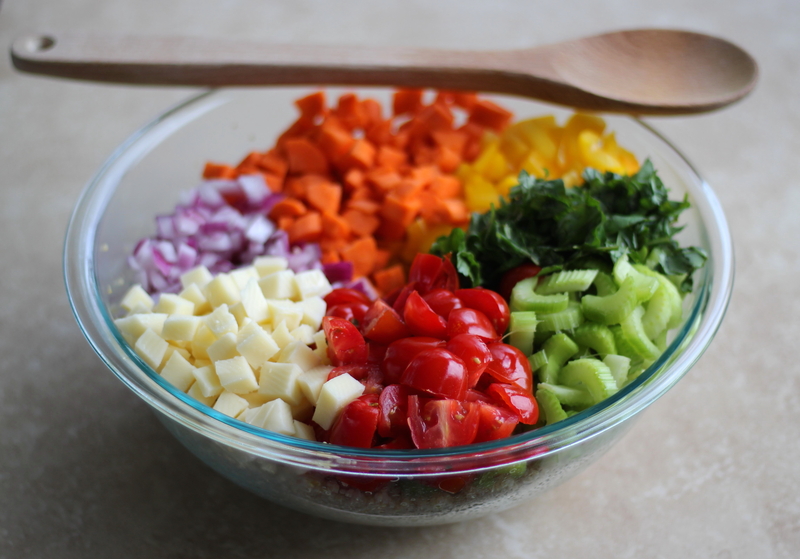 To the bowl of cooled quinoa, add the diced veggies, cheese, and basil. Add the dressing ingredients to a mason jar or other container with a lid and shake vigorously. 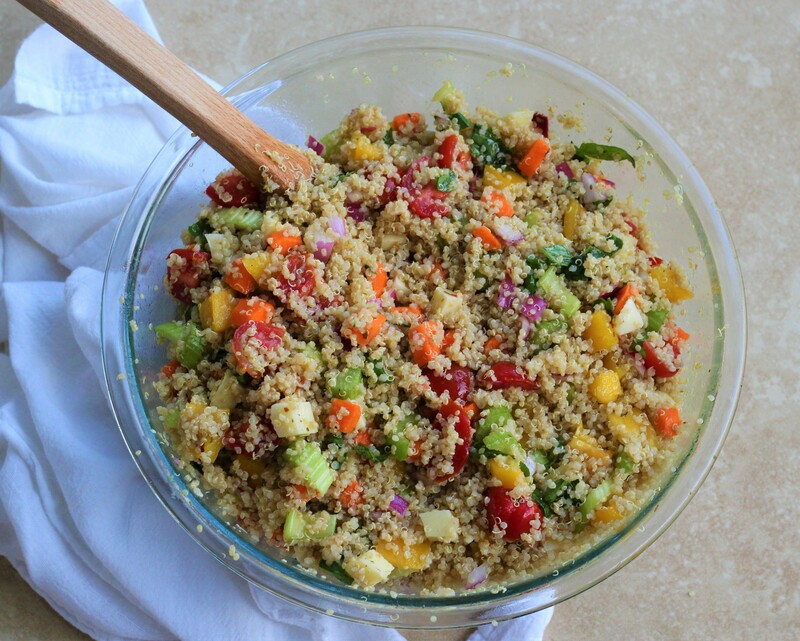 Mix the dressing in with the quinoa salad until it's well-coated. And you're done! You have a beautiful, healthful garden pasta salad to enjoy!